I've always found the Knight of Swords to be interesting because he is moving in a direction that appears like he's revisiting the past. This doesn't mean that this Knight is longing for the past. Instead, he wants to address a yet-resolved issue. He's revisiting his past actions to determine how to better move forward to resolution. What do you need to resolve? What steps might you need to revisit to fully understand how to move forward? Swords can represent a lot of different careers, such as surgeons and police offers, but Knights always represent movement, a lot of movement. With this Knight, I always ask if there is someone in a querent’s life who might be revisiting them for some reason. Or, do you need to revisit someone? If this applies to you, know that you might hear from someone you thought was long gone. Or, you might be the person to initiate contact. With regard to the Knight of Swords’ movement, once he starts a journey, nothing can get in his way. However, because he’s so focused on achieving a particular goal, he can be blinded to others’ needs. If you have someone in your life acting like this, you’ll probably need to tackle them gently and remind them that you exist. The Page of Wands appears whenever news needs to be delivered about something important or big. Have you been looking for a new job? There could be good news coming your way. Are you involved in community work? You might find yourself being asked to take on new responsibilities. Whatever area of your life you’ve been focused on lately, the Page of Wands is here to remind you to keep a positive attitude and keep persevering. We all know how difficult it can be when you’ve been trying to do something for a while and keep running into obstacles. The Page of Wands brings in new enthusiasm so you can see clearly. His appearance doesn’t usually indicate that you can stop working on a project or a goal. The Page of Wands asks you to give it one last good try. Then, if you truly think it’s time to move on, do so. But don’t give up quite yet. For me, this is a good reminder that I must continue writing and submitting my poetry and short stories to literary magazines. I also can’t give up on trying to get my memoir published. What are you trying to accomplish? Whatever it is, no matter how many obstacles, give it one more try. You never know what surprises July might bring. When I do readings for people they always freak when the Death card appears. This card does not mean an actual death is imminent for anyone, though. It means that a major phase in your life is ending. Now, if a relationship ends or you lose your job that will be painful. However, when you look back, you’ll probably see that this ending was a positive. April through June – Keep at It! You’ve Done So Much! Marvel, Then Rest! Before I provide the reading for the next three months, know that I won’t be providing images of the Tarot cards from this reading and going forward. I found that most of the Tarot cards online now have copyrights assigned to them, so I can’t use them. I hope you’ll still find the readings useful. The Queen of Wands is all about getting things done. She is full of energy and she moves forward without any fear. When she appears in readings, she is letting you know that you are doing the same. You are on fire. You’re getting things done. You’re moving forward. At times, you might even marvel a bit at yourself and your confidence. That’s okay. It’s always good to take stock and ensure you’re moving in the right direction. But take the month of April and really focus on what is most important to you. You can focus on something that seems small, like cleaning out closets, or you can concentrate on larger issues – finding a new job, working out more, going back to school – whatever you think will get you what you want out of life. And remember, even when all is going right, you still need to be aware of what might be lurking around the corner. Don’t get so excited about what’s going right that you become oblivious to details that can stall you or even people that can throw roadblocks in your way. April should be a good month, so enjoy it. 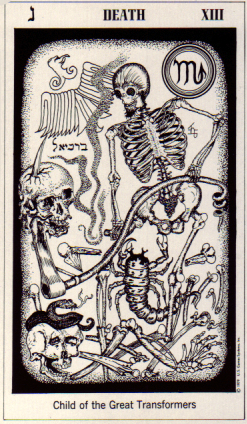 Many people freak when they see the Death card in a Tarot reading, as they think it represents a physical death. This card does not represent an actual death. Instead, it represents an ending. While endings can be tough to deal with, the Death card always heralds a positive new beginning. Most people don’t like change, and sometimes, change is awful – like when you lose a job. However, quite often, a job loss can be a good thing as you go on to find a job you like more than the one you lost. So, don’t be afraid of the Death card. Be proactive and maybe make all the changes you know you need to make before the Universe makes them for you. Do you need to quit smoking? Work out more? Eat better? Now is the time to break any bad habits and get started down a new path. Also, if you have put aside projects for too long, now is the perfect time to write that book you’ve been harboring in your heart. Learn how to speak Spanish. Take a cooking lesson. Do something positive to shake up your world. And if you find people leaving your life, feel free to mourn, but know it was probably for the best. This is the perfect time to end toxic relationships, as well. Start out the New Year with a clean slate and be committed to living a more authentic life in 2018. 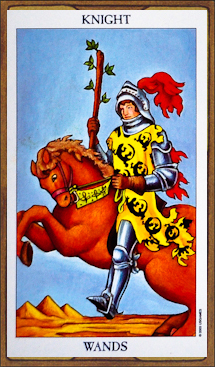 The Knight of Pentacles is slow and steady and efficient. Before he starts a new task, he plans well, and when he embarks on a new adventure, he will use the best routine or methodology he knows of, as he is all about being successful. And great planning can help lead to success. So, if you’re thinking about starting something, be it new hobby or looking for a different job or starting a new exercise routine, with a little planning and the energy of the Knight of Pentacles, you’re on a good path. Now, if you’re currently working on a project or task and you don’t feel that things are moving along as smoothly as they could, the appearance of the Knight of Pentacles means that you might have ended up on a path that is not conducive to success. Take some time and re-evaluate where you are within the original plan, and if necessary, make tweaks to the plan or create a new one. The Knight of Pentacles reminds us to always look at the planning aspect of anything before struggling forward or just throwing all plans away. After a new or updated plan is in place, proceed forward in a step-by-step, well-paced way. Remember, the outcome you want is that of success. So, don’t rush. Feel free to double-check your progress along the way, and if you have to rethink the original plan, or even a successive plan, then do so. The Knight of Pentacles is all about success and he’s willing to make as many adjustments as necessary to reach the final goal. Considering the nightmares that afflict most of us because of various events - from Putin putting Trump into office or cops killing innocent, unarmed Black people, or bigots mowing down people worshiping in mosques, I have to admit to being surprised that the Ten of Cups appeared for this reading. However, with all the nastiness that is occurring around us, I think we should accept this lovely Ten of Cups energy as a gift and see what is happening in our personal lives that are making us feel good, or have the potential to bring happiness. The Ten of Cups represents joy and fulfillment. Many use this card to read events within a family structure, but I’ve always read it as being symbolic to all kind of happiness. If you’re trying to get another degree or want to travel to a faraway place and the Ten of Cups appears, then know that you are on your way to fulfilling this dream. The Ten of Cups can certainly indicate a happy family or show that a new relationship has a solid foundation, but it can also let you know that it’s okay to live the way you want to, ensuring that you are finding ways to put a smile on your face. This might be as simple as making time for a cup of tea every day or finding an extra thirty minutes to exercise. Whatever it is that makes you happy, then tap into this energy and create your own rainbow around your life. How is everyone doing? I hope the reading I did that covered last December through this past month have been helpful. I apologize that I've not done monthly readings on top of this quarterly reading, as promised. But, on top of the many tasks and people that keep me busy and while trying to continue to write, all the while vehemently hating how 45 is destroying America (and possibly, the world), I’ve found myself just too exhausted to take on another task. So, please forgive me! Know that I’ll do my best to provide quarterly readings that help you get through all that you’re dealing with, as well. And if you have any questions, you can always ping me on Facebook (facebook.com/9elephants/), Twitter (@EllenBWriter), or through this blog. Things are more than a little nutty out in the big, wide world. But, for us personally, April can be a decent month. The Queen of Pentacles always brings with her a bit of love, good news, and more often than not, some kind of a gift, be it an object or money. This Queen also lets all of us nest a little bit when she shows up. So, if you’ve been wanting to bake or clean out a closet or even set up a workroom, March is the time to do so. April will also be a good time to review your finances and see where you can make changes that will pay off in the future. Can you save a little bit more? Cut down on some luxuries you might take for granted? Unless you’re part of the 1%, I know that money can always be a tough issue to tackle. But, if nothing else, use this month to figure out what you can do to make your future more stable. Hey. 2016 has been so rough on so many that the majority of us were just hoping to make it through November 8th and after Hillary Clinton was elected President, we could start to exhale, thinking that nothing could be worse than the horror that was this year. Oh, but wait! 2016 wasn’t done bending us over and early in the morning of November 9th (worst birthday ever, btw), Hillary Clinton conceded the Presidency to Donald Trump, a known sexist, racist, xenophobic, fraudulent man who uses everyone to stroke his thin skin and narcissist, sociopathic ego, while assaulting every woman his tiny hands decide to grab, forcing his lying tongue down their throats. I suspect 2017 is going to be much worse than 2016! Wheeeee! This year, instead of doing a reading for the entire year, I’m going to do a reading for this December, along with January, February, and March of 2017. I’ll provide quarterly readings throughout the year. This way, you won’t have to scroll through a year’s worth of readings. As I've told my daughter and a few friends, I've had an awful feeling about the United States 2016 election since this past September. In the early hours of November 9th, my worst fears were confirmed and Donald Trump is now President Elect. Thanks for ruining my birthday, Donald. I also requested that if Putin had been involved in throwing the election Trump's way that The Devil would appear, and if Russia was involved in actual hacking of the votes, then The Tower would appear. First card out of the deck - King of Swords. Comey, you're busted. As I continued with the reading, both The Devil and The Tower appeared. As I ruminated on this horrifying election, the one thing that stood out clearly to me was the fact that Black women were the only group in America that tried to save us from ourselves. I then got to thinking about how many times Black women have been heroes so I googled "how black women keep saving America" and based on the results, I wrote a blog by the same title. However, the person in charge of the blog site that requested my blogging talents back this past Spring felt like the blog was too political and wouldn't publish it. So, I'm publishing it here. Remember last June, when the Eight of Swords appeared and I told you it wasn't going to be a fun month? Guess what? Neither is November, because the Eight of Swords has returned. When I pulled this card, I just groaned. Like many, I’m absolutely exhausted from having to deal with the non-stop horror of the current election cycle (I blame Republicans and their deplorable followers), and not surprisingly, things at work have become even more crazy as the Powers That Be are implementing yet another round of changes, hoping to stave off the potential demise of a company they’ve nearly destroyed, and I’m watching my daughter begin her third year of a graduate program that we thought would take only 2.5 years years to complete (and, she still has multiple internships to get through, even as she’s down to needing to take only one more course after this semester). I found out I have to have a full shoulder replacement, thanks to one (or more) of Dad’s many beatings he laid on me when I was young, causing my left shoulder to be near demise (and now, my right shoulder is making funny noises). I’m still working on both a weekly blog, as well as this monthly blog (and yes, I know I’m late in posting this month), and I’m still hoping to get a book of poetry published in December. The Three of Pentacles indicates that you are working toward a goal and are moving in the right direction. If you’re working as part of a team, the Three of Pentacles indicates that everyone is working well together. If you’re working solo on a goal, this card reminds you to take all constructive criticism to heart, because those who offer feedback want you to win. They’re not criticizing; they’re helping. 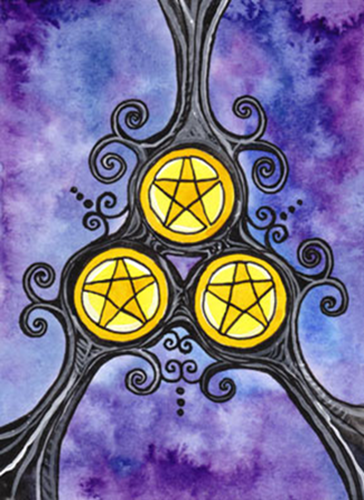 The Three of Pentacles represents the kind of feedback you need to be the very best! The Three of Pentacles reminds you that you have all the talent and skills and intelligence necessary to complete the work required to meet your goal. Instinctively, you know this and this is one reason you’re moving onward towards success. 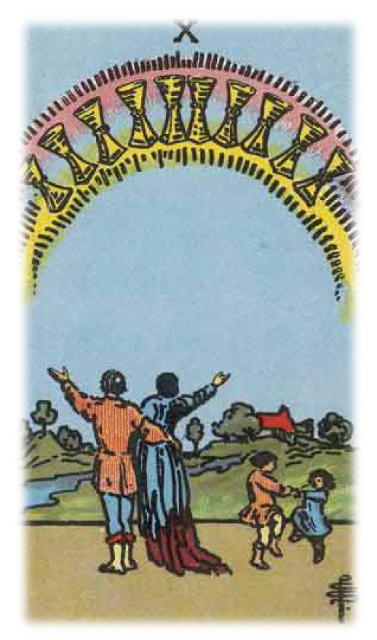 If you are working with others, this card indicates that everyone is on the same page, with the same goal in mind, and no one is trying to outdo the other. You’re in it to win together! If you feel the need to put together a plan or schedule to help you keep on track, do so. But, if you’re moving forward and all is well, then keep on down your path. However, if at any point you feel you might do better with a detailed plan or schedule, it’s never too late to create one. After having spent the month of August dealing with some tough energy, celebrate working with the Queen of Pentacles during September. This card offers nurturing and caring and indicates that you have been and will continue to be supported to succeed. The Queen of Pentacles can also represent a caring, giving presence in your life, or it could indicate that you are the person who offers nurturing and advice to others. Whether you’re the nurturer or you’ve had another person helping you out, then know that this card indicates you will either remain supported or you’ll be called upon to help others. Either way, realize that caring is a circle. If you’re receiving support and are being nurtured, then find out how to do the same for another person. And, if you’re already providing care to others, then know that you’re services are still needed and appreciated. Another meaning for the Queen of Pentacles is that of a solid financial foundation. If you’ve been working to save or eliminate debts or whatever it is that you’ve been doing to become financially secure, keep it up. With money, any time you make a positive change, you will see immediate rewards. But, with the support from the Queen of Pentacles, you can create a plan that will provide future financial success, as well. If you are not doing what you need to do to strengthen your financial platform, the appearance of this card indicates that you need to start making the necessary changes, now! If you do so, prosperity and security should be yours. 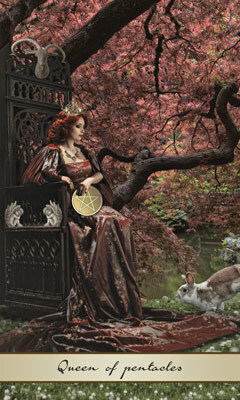 The Queen of Pentacles also reminds us to be aware of stress and to find ways to create a calming environment. Whether yoga, music, exercise, or nature calms you, use the month of September to think about how you can make changes in your world so that you can feel better. This is especially true for those of you who live with other family members or close friends. You’re all interdependent and if you treat each other with kindness, then your living spaces will be more comfortable. Home will be a place that nurtures you. So, take the month of September to figure out where you are with a task or goal and be sure to thank whoever has supported you during this time. If you’re the nurturer, know that this month might ask you to give a little bit more than usual. But, don’t forget to take care of you, as well. Rest. Rejuvenate. Continue building that calm and financially secure foundation. Be ready for success! 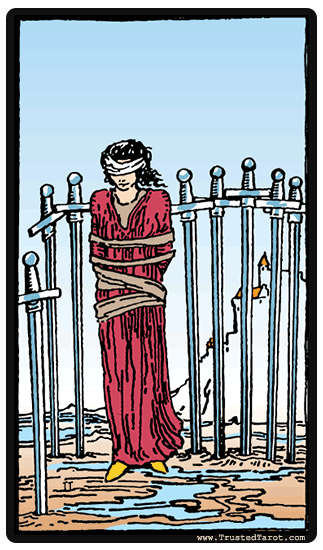 Well, here we are dealing with yet another not-so-positive card, the Seven of Wands. This card indicates a confrontational August, which is probably the last thing any of us wanted to deal with, but here we are. A confrontation could appear in any aspect of your world – at work, at home, between friends, between family. The important thing to remember is that you will need to remain steady and calm when you find yourself in a situation where you’re being asked to prove yourself or defend an idea or goal. While the Seven of Wands is not the most delightful of cards, its secondary meaning hints at competition that doesn’t have to be negative. Perhaps you’re interviewing for a new job, but so are several other people. Perhaps you’re trying to make travel plans, but you can’t find the perfect hotel room for the right price. None of these situations are necessarily nasty. Frustrating, but not intrinsically damaging. In these situations, recognize that things aren’t going as well as they could, take a deep breath, and keep on trying. Eventually, you’ll find the right job or the perfect hotel. When the Seven of Pentacles appears in a reading, rejoice. This is a lovely and rewarding card, as it indicates that your hard work is beginning to pay off. Rewards are nearby, and it's quite possible you’ve already reaped the results of many hours of hard work. When the Seven of Pentacles appears in a reading, rejoice. This is a lovely and rewarding card, as it indicates that your hard work is beginning to pay off. Rewards are nearby, and it’s quite possible you’ve already reaped the results of many hours of hard work. The Seven of Pentacles indicates that you know that no matter how deep a desire, you have to put in the hours and dedication to manifest a dream, and now your hard work is either close to paying off or you’ve already been able to claim success. You have been working with an understanding of the bigger picture and you’ve been willing to spend the time and energy to reach a destination. If you still have a bit of work to do, the Seven of Pentacles is urging you to complete it. If you’ve successfully completed a task, take a bit of time to enjoy your success. Also, if you’re now mulling starting something new, this is a great time to do so. Start planning and then be prepared to put in the work necessary for a successful outcome. © Copyright Ellen Black. Designed by Shaila Abdullah.